A round-up of the latest genealogy news. RootsTech also livestreams some of their sessions for those who did not attend. You can watch the Saturday morning sessions here. Also, keep watching the RootsTech homepage. They are kind enough to record the sessions for later viewing for those sitting at home. Launch of a New Archive of Roman Catholic Parish Records – FindMyPast has announced a major new initiative for ancestral records. They will be creating a new Catholic Heritage Archive. It will consist of Roman Catholic parish records from Ireland, the United States and the UK. Eventually, this collection will consist of up to 100 million records and will be exclusive to FindMyPast. You can read the full announcement here [Roman Catholic Parish Records]. Already this week, FindMyPast has released Roman Catholic parish records from Philadelphia and the 1893 Roman Catholic census from the Archdiocese of Westminster, UK. You can read about the latest records here. A New App to Help You Trace Irish Ancestors – Ancestor Network, a leading provider of genealogy services in Ireland has just released a new app to help guide people around Dublin who are looking for ancestral records. It shows you the location of libraries, archives, research centres, historic sites and museums that are related to genealogy. This past week was the anniversary of D-Day, which occurred on 6th June. On that day in 1944, President Franklin Roosevelt gave a radio address to America talking about the invasion. You can listen to it below. For those genealogists who like to attach multimedia content to their family tree, FDR’s speech provides great historical context to the period. For those fans of politics, this speech provides a refreshing look-back at how politicians addressed the public, as opposed to what we hear from politicians today. One of the challenges genealogists face when looking at historic documents is that town, city, county and state lines tend to get redrawn over time. Bet you thought that was a thing of the past? Apparently, it is not. The latest Australian government budget for the National Library of Australia has no new funding for Trove. That means going forward there will be no new additions to their extensive collections. Yikes! Jennifer McLaren’s genealogy blog provides more information. In our opinion, the National Library of Australia has the best online resource for genealogists than any other national library. They have digitized for free historic newspapers, government gazettes, historic newspapers, diaries, letters, maps and more. It has an astonishing 487 million items online. The website can be searched using the Genealogy Search Engine. •	United States: Arizona Memory Project, 1940 New York City Census, WWII airmen service records, various marriage lists from all 50 states, a few university newspaper collections and local cemetery records from several states. •	Canada: personal records from Alberta and tombstones from Saskatchewan. •	England: historic military cadet records. •	Ireland: historic government documents, inquiries, legislation and debates. •	Germany: historic newspaper articles. •	Belgium: various parish records. •	Australia: lots of new records from the Trove system. The Mocavo website has shut down. Mocavo was an ancestral search engine. It was backed by a firm based in Boulder Colorado. They launched with great fanfare in March 2011. Mocavo started out as a free search engine. Their original platform found free genealogy records available on the internet. By the end of 2011, however, they began the switch to a subscription model. Apparently, the increase in subscription revenue was not enough to sustain the company. In May 2012 (just 14 months after launch) they received $4.1million in venture capital money to help expand their operations. Mocavo used some of the funds to buy a small scanning company. They started scanning and putting online some unique records. In particular, they started putting online US high school yearbooks at a time when there were not many available on the internet. They also expanded to a full subscription model at around the same time. Although Mocavo had some initial success, they were never able to gain the traction needed for a company funded by venture capital. In particular, their rankings over the years in the Top 100 Genealogy List showed that they were never able to break into the top ten (the Mocavo rankings were 2012 #45 | 2013 #25 | 2014 #28 | 2015 #20 | 2016 #32). Mocavo was eventually purchased by FindMyPast in June 2014. Presumably they were interested in Mocavo’s search technology. FindMyPast has now decided to fold Mocavo into the FindMyPast website. This is a common approach in the genealogy industry when a large company buys out a smaller competitor. Eventually they tend to shut them down. Here is the official announcement. We always viewed Mocavo as a bit long on promise and a bit short on delivery. When they launched in March 2011 they also claimed to be the first large scale ancestral search engine on the internet. That was not quite true. For example, we had launched our own Genealogy Search Engine in January 2011, about two months prior to Mocavo. What they had done is launch a website with some unique search technology, which has now been folded into FindMyPast. This is what the Mocavo website looked like when it first launched around 21 March 2011. A major new family history software package just launched this week. Called TreeView, it is designed for both Windows and Mac. The software is backed by the popular UK genealogy website TheGenealogist. It looks intriguing. Obviously, given the size and scope of this software package, it has been in development for a very long period of time (certainly many months before the Ancestry announcement to abandon Family Tree Maker in December 2015). We find it interesting that one company (Ancestry) decides to abandon the desktop genealogy software market at the same time another company (TheGenealogist) decides to enter it. TreeView has various charting and graphing packages, including the ability to map locations for your ancestors. Image Courtesy of TreeView. Ancestry announced this week that it has sold the popular Family Tree Maker software program to a company called Software MacKiev. This is a bit of an about-face by Ancestry who announced in December 2015 that they were going to retire the popular Family Tree Maker program (see the December 2015 news section below). Now it looks like the software will have a new life under a different company. Apparently, this will mean regular software updates and new versions in the future. The program will also continue to have access to Ancestry functionality like hints, searches and the ability to store your family tree on Ancestry. Ancestry also announced this week that they are working with the RootsMagic software program to enable it to connect/interface directly to Ancestry by the end of 2016. For those who are not familiar with Software MacKiev, they seem to specialize in buying and running end-of-life software primarily for the Mac computer. They own Print Shop (for Mac) and Mavis Beacon Teaches Typing (also for Mac). These are two titles that may be familiar to readers from the early days of personal computers. The company is based in Kiev, Ukraine. Presumably the name of the company is a combination of Mac + Kiev = MacKiev. In the background, Software MacKiev has apparently been the developer of the Mac version of Family Tree Maker for several years. Obviously, they are very familiar with the product. This recent announcement buys some time for Family Tree Maker users. However, we are not convinced that it would be a good idea to remain with this software program over the longer term. Clearly Ancestry is getting out of the desktop software business. If you are a current user of Family Tree Maker, you might also want to seriously think about your options going forward. It is never a good sign when a company abandons its own product, like Ancestry did with Family Tree Maker in December 2015 (see December news below). If you have any comments/questions/concerns, we suggest you address them to the official Ancestry blog post on this announcement. RootsTech takes place this week from Wednesday Feb 3 to Saturday Feb 6 in Salt Lake City, Utah. It is the largest genealogy conference in the world. You can follow all the action at RootsTech live from the comfort of your home using our free Genealogy Tweet Stream. This week unfortunately we made the news. Many of our newsletter readers have written to us because our popular (and free) Genealogy Toolbar no longer works with the latest version of Firefox. This happened with the latest Firefox update that occurred near Christmas time. The message from Firefox is that the toolbar is corrupted. First of all, let us say that the Genealogy Toolbar is not corrupted. What has happened is that the latest version of Firefox has enhanced privacy functions. This requires all add-ins (including our toolbar) to have a certification license. Unfortunately, we cannot afford to spend a few thousand dollars to certify our free product. We have tried hard to find various workarounds, but to no avail. So sadly, we must tell you that our Genealogy Toolbar is no longer functioning. We feel really bad about this. Sorry to be the bearer of bad news. In a blog post this week, Ancestry made it official. They are now moving everyone to the new Ancestry website. This has created a certain amount of controversy in genealogy circles since some people don’t like the new Ancestry. The need to interact with family trees as opposed to doing a simple ancestral search is a feature that many find particularly annoying. It is certainly no coincidence this announcement comes one week after the announcement of the shutting down of the popular Family Tree Maker software (see our previous article below). From a business perspective, what Ancestry is doing is fairly straight forward. They now have a two-step process for retaining customers. They not only want you to find the ancestral record you need, but they also want you to keep it on their website – forever. Obviously, someone at Ancestry has done the math and realized the number of annoyed customers they will lose from these two moves (shifting to the new Ancestry and shutting down Family Tree Maker) will be more than offset by the extra revenue the company will generate from other people keeping their subscriptions longer because they want to hold onto their online family trees. Big corporation thinking really. Before we get flooded with emails asking us to contact Ancestry, we thought you should know that we gave up sending emails to Ancestry a long time ago. For us, they seem to employ a standard strategy that large corporations use in many industries - they view us as a potential competitor so they don’t acknowledge that we exist. They do this by not sending us press releases (Ancestry is the only one in the industry that does not send us press releases even though we have asked them), not acknowledging our sent emails, never mentioning our website in any of their publications (including via the bloggers they pay) or if they have to mention us, then it is done in a negative manner, etc. Basic big corporate stuff really. They probably don’t like our free Genealogy Search Engine (a free alternative to their search engine) or our Top 100 Genealogy Websites List (which provides an accurate overview of the genealogy industry, including how much they dominate the space). All this to say you would be wasting your time if you sent us an email. We have no voice with Ancestry. One thing that has been missed in all the online discussions about this issue is that it has been several months since Ancestry has actually added any new major record collections to their website (just go through our newest genealogy records list to see the last time we mentioned Ancestry). For several months now, Ancestry has been incrementally updating old record collections, scrapping free record collections from the internet and publishing free data sets they received from FamilySearch. But no major new record collections. We doubt this can be a coincidence since some of their competitors (like FindMypast) have been going great guns this year with original new record collections (once again, you can see the pattern if you scan through our newest genealogy records list for the last several months). In our September 2015 genealogy news (scroll down below to the September section) we mentioned back then that we thought Ancestry had quietly shifted strategy from historic records to keepers of life records for the current generation. Perhaps we were right? Something to think about before you renew your Ancestry subscription if your main purpose for doing so is to stay on top of potential new record collections. Going forward, you might not see many new original ones from Ancestry. On a more positive note, we have decided to sit down during this holiday season and add as many new genealogy records as we can find to our free Genealogy Search Engine. We have already indexed over a thousand websites in total for our search engine and we will continue to add more over the holiday period. This will be our Christmas present to you. Merry Christmas! This week, Ancestry announced they are going to retire Family Tree Maker. Here is the official announcement. The company has decided to stop selling the program effective 31 December of this year. They will continue to provide technical and other support until the end of 2016. Obviously, this is going to be frustrating for many users. What this means to you will depend on how you use the program. For example, the company says that their popular TreeSync feature will continue to work for another year (until the end of 2016). So basically, you have a year to either migrate to other software or continue to use Family Tree Maker beyond 2016 recognizing that there no longer will be any support for the product. If you don’t use the links to the online family trees or any other online content then this may be a perfectly acceptable solution. Not surprisingly, other family tree software companies are now actively gearing up to court Family Tree Maker users. If you do an online search for genealogy software, lots of options pop up, including lots of recent blog posts recommending product A over product B. One thing you might want to consider carefully in your decision is to think about what programs are likely to be around for the long time. You don’t want to switch to a new software package only to have it too disappear in a year or two. A good place to start your search for new genealogy software is to go through our latest Top 100 List. It will give you an (unbiased) idea of who the biggest players are in the space. Just look for the categories ‘software’ for desktop and ‘family tree’ for online. For what it is worth, for the desktop we like Gramps (which was just beyond the Top 100 List last year) because it is a) free and b) supported by a large community of volunteers. They just came out with the latest version of their software two months ago. For people who have multimedia files and want to store their information in the cloud, we are partial to Crestleaf. Incidentally, if you have any comments, concerns or issues, here are the contact details for the Ancestry Member Services Team. The genetic testing company 23andMe is at it again. First they got slapped hard by the US Food and Drug Administration for trying to sell unauthorized medical tests. Then after several months they finally got this sorted out just last month and received the proper approvals from the USFDA. Ever wondered what the first Christmas card looked like? Below is what is thought to be the first ever Christmas card from 1843. Today, people still send some 750 million Christmas cards each year. The first commercial Christmas cards began in the Victorian era (not counting religious-themed prints that go back to the Middle Ages). The idea of a specialty Christmas card began with John Callcott Horsley, who designed and sold 1,000 specially printed Xmas cards in London in 1843, as shown above. Notice in the image the engraver has snuck in a child drinking wine (in the middle, just above the coat of arms). This week, we have launched a new website devoted to fine art photography. Many of the images have a heritage theme that will appeal to genealogists. Our new website allows you to purchase museum quality prints at reasonable prices. This is an example of an iphone case that you can order from one of the images on the website. The watermark at the bottom right hand corner of the image does not appear on the final product. A website called #AncestryHour is devoted to people who use Twitter to look for their ancestors. To quote the website “#AncestryHour is a Twitter base where everyone, professionals and amateurs alike, with an interest in Genealogy and Family History can meet, exchange tips, promote their services, ask questions, etc.”. The video below describes how it all works. Two announcements out of Ancestry.com this summer suggest the company has made an important change in their future growth strategy. The first was an announcement of the launch of a new service called AncestryHealth. This service allows users to combine their personal family health knowledge with family trees that have been created on Ancestry websites. The second was an announcement that AncestryDNA had sold the results of DNA sequences collected from some one million Ancestry customers to a Google-affiliated company called Calico. Calico is focussed on longevity research. What makes the dataset so valuable to Calico is both its size and the fact that it comes with extensive family trees. Calico will be studying the DNA results combined with the family trees of Ancestry’s DNA customers to look for patterns in longevity across families. These two announcements combined represent an interesting transition for Ancestry.com The company appears to be making the jump from provider of historical records for past generations to keeper of life records for the current generation. Considering that Ancestry websites control a combined 35% of internet genealogy traffic (see Top 100 Genealogy Websites of 2015), this is an interest shift in strategy for Ancestry and for the genealogy marketplace at large. In the future, there might be more money to be made managing (and selling) the lifestyle data of the current generation than the historical records of past generations. PBS announced this week that it has suspended the genealogy show Finding Your Roots. Hosted by Henry Louis Gates Jr., the show examined the family histories of celebrities and public figures. The integrity of the show came into question as a result of the recent release of the WikiLeaks cache of hacked Sony emails. The hacked emails revealed that Ben Affleck, one of the show’s celebrity guests, had successfully pressured the show’s producers into omitting any reference to a slave-owning ancestor. PBS has demanded several changes before the show will be reinstated. This includes hiring an independent genealogist to verify the show’s content. You can read the details in this New York Times article. Reuters published a story this week implying that Ancestry has been put up for sale. The firm is currently owned by Permira Advisers, a European-based private equity firm. The story suggests that investment bankers have been hired to market Ancestry to potential buyers. The expected price range for the company is somewhere between $2.5 billion and $3.0 billion. As highlighted in the article Top 100 Genealogy Websites of 2015, Ancestry dominates the genealogy industry. The firm controls eight of the top 15 ancestral websites. GenealogyInTime Magazine estimates there is slightly more than 350,000 visitors a day across all genealogy websites and that Ancestry gets 32% of that traffic. The core strength of the Ancestry franchise is the size and convenience of its database, which currently numbers some 16 billion historic records. Subscription fees from 2.2 million paying subscribers account for the bulk of total company revenue, which amounted to $631 million over the last four quarters. Ancestry also has a DNA service, which has seen strong growth over the last couple of quarters. Ancestry’s adjusted EBITDA (earnings before interest, taxes, depreciation and amortization) was $228 million in the last four quarters. An EBITDA multiplier is often used to value established companies such as Ancestry. In this case, it implies that Permira Advisors is looking for roughly an 11.0X to 13.0X EBITDA multiple on the sale of the company. Ancestry is one of the few technology companies with strong cash flow generation capabilities. This allows the company to leverage its balance sheet by issuing debt. The firm had $862 million of long-term debt as of the end of March 2015. The potential sale of Ancestry is not likely to have any impact on current subscribers. Unless, of course, FindMyPast or MyHeritage were to purchase the company. Iceland Originally Settled by Scots? An intriguing new book by archaeologist Dr Kristján Ahronson suggests that Iceland may have been visited and even partially settled by people from Scotland several years before the first wave of Norse settlers arrived on the island in the year 874 AD. The evidence is based on a series of some 200 man-made caves in the southern part of Iceland. Some of the caves show clear evidence of crosses carved into the walls. These crosses bear a striking resemblance to similar crosses of early Christian communities found in parts of western Scotland. One of the Icelandic caves was accurately dated to show that it existed before Norse settlers arrived on the island. The website MedievalLists.net has more detail. 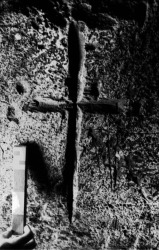 This image taken by Dr Kristján Ahronson shows a cross found in one of the man-made caves in southern Iceland. The cross pre-dates the first Norse settlers to the island. Note the hand in the bottom right that provides scale to the image. - We have indexed several US college collections of historic photographs and digital newspaper collections. - Multiple local library collections of obituaries have been added to the search engine. - We have indexed emigration records from Scotland. - Some regional parish records from Belgium and Spain are now covered by the search engine. This week, FamilySearch and the New England Historic Genealogical Society (NEHGS) announced a new collaboration. It will see some one billion records from FamilySearch added to the NEHGS website AmericanAncestors.org. The records will consist primarily of US federal census transcripts (1790 to 1930), civil registrations for Italy, Germany, Scotland and the Netherlands and English parish records. In addition, one billion family tree records from FamilySearch will also be available on the NEHGS website. Google has announced that Google Earth Pro is now free (thanks to Lisa Louise Cooke for pointing out the announcement). You can think of Google Earth Pro as Google maps on steroids. Basically, it allows you to look at satellite images from a three dimensional perspective. For those who already use the standard Google Earth version, the Pro version has more features, such as advanced measuring tools. For example, it has the ability to measure the size of irregular properties as well as the distance between any two points. RootsTech will be held this Thursday 12 February to Saturday 14 February in Salt Lake City, Utah. It is one of the largest genealogy conferences in the world. In addition to their excellent website, you can follow all the action in real-time from the comfort of your living room. The British Library has opened their new high-tech building for long-term storage of their national newspaper collection. The new building stores some 60 million historic newspapers spanning three centuries. The newspapers are kept in a dark, low-oxygen, constant temperature and humidity environment. See the images below. We talked extensively about this building about two years ago. It is good to see that it has been completed. So far, only a small fraction of the newspapers have been digitized. Roughly 10 million pages out of 750 million pages in total housed in the building have been put online through the website British Newspaper Archive. The National Newspaper Building houses 33 km of newspapers in racks 20 meters high. It is essentially an automated warehouse. Robotic cranes retrieve the newspapers as required. The system can manage 42 retrievals per hour. 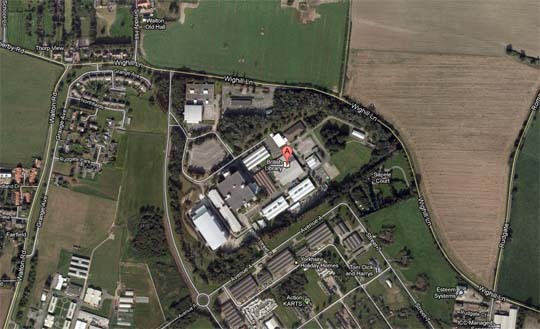 This is an aerial view of the National Newspaper complex in Boston Spa, West Yorkshire. The site covers approximately 40 acres (apparently, at one time the location housed an armaments factory). Temperature inside the main building is a constant 14 degrees C with 55% humidity. This is what the National Newspaper Building looks like from the street. There is a reading room at the facility that is open to the public. Social Media and Seniors – Pew Research has released an updated study on how people use social media websites like Facebook, Pinterest and Twitter. Not surprisingly, Facebook remains by far the most popular social media website. Certainly for our website, we get more traffic from Facebook than all the other social media websites combined. 23andMe Sells Your Genetic Data – Here is a story from the tech website Gizmodo on how 23andMe has found another way to monetize their customer’s DNA. It is a must read for anyone who has used their products or is considering using their products. We find the article a bit disturbing on several fronts. DNA is like a fingerprint that uniquely identifies an individual. It also contains a person's complete heritage and medical history. So who controls this extremely personal information? In the case of 23andMe, apparently not the customer. Now that 2014 is over, Google has prepared an excellent video describing some of the major search themes of the year. Ancestry.com has produced a report on the current state of the company and of the genealogy industry in general. The full report can be read below (click on the expansion button near the bottom right hand corner to read the report in full screen mode). Free Cash Flow of +$31.0 million. Subscribers 2,125,000 (+0.75% quarter over quarter). 3.3 million new records on UK website. 2.6 million new records on Canadian website. 1.2 million new records on Australian website. Tens of millions of new records on US website (exact amount not specified - many appeared to have come from FamilySearch given their new sharing agreement). Are People with the Same Family Name Related? How Many People Live to 100? At GenealogyInTime Magazine, we notice people keep making the same mistakes when building their family tree. So we decided to put together an article that pokes fun at how not to build a family tree. See if you can recognize all the subtle and not-so-subtle mistakes. Great News! Many people had asked us to make our Genealogy Toolbar work with the Google Chrome browser. We are happy to report that our very popular Genealogy Toolbar now works with Chrome in addition to Internet Explorer and Mozilla Firefox. Just download and run it. A Restarted Google Newspaper Archive? Trying to trace an ancestor who migrates within a country can often be challenge. Unlike ancestors who emigrate across an ocean, there are multiple routes that an ancestor can take when migrating within a single country or region. An electoral roll (known formally as an electoral register) is a list of people who are eligible to vote in a given jurisdiction. Electoral rolls are valuable to genealogists because they tie the name of an individual to a specific address. GenealogyInTime Magazine has made a major upgrade to its free Genealogy Search Engine. An additional 256 million more ancestral records can now be searched for free. The Genealogy Search Engine now indexes 1.8 billion free ancestral records across more than 600 websites from around the world. What are the Most Popular Internet Browsers? GenealogyInTime Magazine has put together a global list of the Top 100 Most Popular Genealogy Websites. This is the first time a comprehensive list has been published of the most popular genealogy websites from around the world. Other genealogy lists exist, but they tend to focus on only one country, on only certain types of genealogy websites, or the list contains personal preferences. Looking for a cool new tool to help you find your ancestors? Look no further! GenealogyInTime™ magazine is pleased to announce a free toolbar that will take your genealogy research to the next level. Fun, easy to install, and easy to use, our genealogy toolbar sports an elegant interface and several innovative features. Want to spend more time working on your family history and less time keeping up with the latest genealogy news? We do, so we invented the Genealogy News Reader. Version 2.0 of our popular Genealogy News Reader has been totally rebuilt. It scans thousands of news sources looking for stories related to genealogy. It then amalgamates all the stories onto one web page. The Genealogy News Reader updates itself automatically. You can keep the web page open in the background as you work or just refer to it every couple of days when you want to know what is going on. How Does Google Improve Search? At GenealogyInTime Magazine, we notice people often make the same mistakes over and over again when building their family tree. Sometimes these mistakes are subtle and sometimes they are not. The obvious mistakes are the ones that really bother us. With that in mind, we decided to take a rather unique approach to solving this problem. GenealogyInTime Magazine is happy to introduce Genealogy Buzz, a fun new way to observe and interact with the genealogy community. GenealogyInTime Magazine has created a fun little tool called the Genealogy Twitter Reader. It streams the latest genealogy tweets to you in real time from hundreds of genealogy users. Every 5 minutes the reader will automatically update with the latest genealogy tweets from the internet. The Genealogy Twitter Reader is a fun and interesting way to follow what is going on in the genealogy world. It is a great way to track your own tweets and to look for other genealogy users to follow. Finally, this is a fun web page you can leave on in the background. As you do other work on your computer, the Genealogy Twitter Reader will automatically update, and you can refer back to it occasionally to read the latest genealogy tweets. Searching Online for Your Ancestors - There is an unprecedented amount of genealogy information on the internet. Tapping into this information, however, can be difficult because ancestral records are spread out over many different websites. Consequently, a key challenge facing genealogists is to determine the best and most efficient approach to finding ancestors on the internet. Genealogy This Week - 7 November 2009 - This week we thought we would do something a little different and talk about the Ancestry.com IPO (Initial Public Offering) share listing that occurred this week. This is the first time a private genealogy company has done a large public share listing. What makes this particularly interesting to genealogists is that Ancestry.com is by far the largest company in the field of genealogy. When a company goes public, they have to release a wealth of information about their company, their business model and their industry. In this case, the company, the business model and the industry is all about genealogy. The IPO document alone runs to 156 pages. We read it. We also read several analysts’ reports on the company and talked to various people in the industry.